A renegade CIA agent (Guy Pearce), falsely accused of murder, must overcome a gang of ruthless prisoners held 50 miles above Earth and rescue the President's daughter (Maggie Grace) in order to regain his freedom. Featured in a small role in the more high-profile Prometheus, Guy Pearce takes the lead for another 2012 sci-fi effort via Lockout. Set in 2079, we meet a former CIA agent named Snow (Pearce). He finds himself set up in an operation gone wrong and falsely accused of murdering fellow agent Frank Armstrong (Miodrag Stevanovic). In the meantime, the president’s daughter Emilie (Maggie Grace) goes to tour MS One, a high-tech prison. Located in space miles above the Earth, it keeps prisoners – the worst of the worst - “asleep” in stasis. Emilie checks out the location as part of a humanitarian mission. This doesn’t go well. The authorities awaken some prisoners so Emilie can interview them, and she encounters Scottish baddie Hydell (Joseph Gilgun). The inmate snags a gun from a Secret Service agent and takes Emilie captive. Hydell then frees the other convicts, a group that includes Alex (Vincent Regan), a more stable Scot who takes charge. As the prisoners take charge of MS One, this sets off a crisis – and gets Snow involved. If he can rescue Emilie, he’ll get pardoned, so we follow his attempts to save the day – and himself. 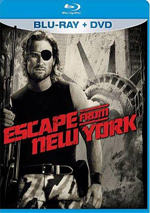 On the surface, Lockout might remind you of 1981’s Escape from New York. Beneath the surface, Lockout might remind you of Escape. While not an out-and-out rip-off of the John Carpenter flick, the two sure do share an awful lot of similarities. The influences don’t end there, as you’ll see other action flicks evident in Lockout; for instance, Snow often gives off a serious John McClane vibe. Despite the film’s serious lack of originality, Lockout still manages to deliver a decent cinematic experience. Obviously, it’s not a movie meant to be taken particularly seriously. It understands exactly what it is: a silly, absurd action effort. It knows it presents ridiculous situations and embraces the general genre sensibility. Lockout borders on parody at times, but it doesn’t quite go there; it has fun with its nature but doesn’t go overboard with self-mocking tendencies. Expect a movie that requires you to check your brain at the door, though. Indeed, when I think about Lockout, its parts come across as weaknesses. The dialogue seems very “written”, as it gives us semi-self-aware “action-speak”; from Snow’s incessant laconic one-liners to Hydell’s crazy talk, we find dialogue that comes across as so typical for the genre that it teeters on the edge of mockery. I also think the film comes with an awful lot of modern references for a story set in 2079. Granted, this isn’t an issue exclusive to Lockout, as many sci-fi efforts come with anachronisms like this, but for some reason, the ones on display here seem more off-putting; will anyone still refer to “partying like it’s 1999” nearly 100 years after the Prince song’s release? Still, despite the film’s flaws, it still gives us enough brainless action and excitement to entertain. It does nothing especially well, but it nonetheless works as a moderately fun part of its genre. Go into it without high expectations and you’ll probably enjoy it. 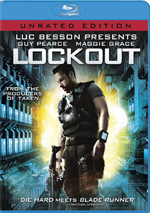 Lockout appears in an aspect ratio of approximately 2.40:1 on this Blu-Ray Disc. The movie came with a strong transfer. Sharpness looked good. Virtually no softness interfered; instead, the movie appeared nicely detailed and distinctive. No issues with jagged edges or shimmering occurred, and edge haloes remained absent. Source flaws were a non-factor, as this was a clean presentation. Like most modern sci-fi/action flicks, Lockout went with a stylized palette. It mixed teal, orange, yellows and blues for the most part. The tones consistently seemed clear and concise within those parameters. Blacks were deep and firm, while low-light shots came across as appropriately dense but not overly dark. Overall, the picture appeared positive. I also felt pleased with the DTS-HD MA 5.1 soundtrack of Lockout, as all of the action shenanigans ensured that the mix offered plenty of involving material. The chaos filled out the spectrum in an active, involving manner that created a fair amount of exciting audio. Elements zoomed and zipped around the room to create an involving soundscape that added a lot of pow to the package. Two featurettes show up here. Breaking Into Lockout goes for 11 minutes, seven seconds and offers notes from co-writer/co-director Stephen Saint Leger, and actors Guy Pearce and Maggie Grace. The show looks at story and characters, the movie’s tone and comedy, stunts and action, the work of the two directors, and effects. No one will confuse “Breaking” for a detailed behind the scenes program, but it offers a decent little overview of its topics. A Vision of the Future runs 10 minutes, 13 seconds and includes comments from supervising art director Frank Walsh, art director Oliver Hodge, and visual effects supervisor Richard Bain. They discuss set design, costumes and effects across this short but informative piece. The disc opens with ads for Looper, The Raid: Redemption, Robot & Frank, Starship Troopers: Invasion and Safety Not Guaranteed. These also appear under Previews. No trailer for Lockout pops up here. Don’t expect Lockout to deliver an original sci-fi action experience, but if you can get past its derivative nature, you’ll probably have fun with it. Though it seems pretty brain-dead, it gives us enough excitement to make it enjoyable. The Blu-ray boasts excellent picture and audio along with a couple of decent featurettes. Genre fans will probably like this unoriginal but still likable adventure.